So I was warned this would be painful….perhaps a little tough…..what I didn’t expect was in the last 30secs (as you will see from the video above) is that I quite frankly didn’t want to sit on a bike again. Falling off the bike at the end is a pretty good indication of this! However this ‘Functional Threshold Power’ test is a key tool to see what level you are at in your cycling training (something which the trainer Wilson – an age group qualifier for the Ironman World Championship in Kona in both 140.6 & 70.3 – reminded me continuously throughout the gut wrenching session) and can be used as a marker for improvement & future goals. It is thus really important that you give everything you have got as Athlete Lab use the FTP figure in your subsequent training programmes – i.e. if you are doing hill interval training in the lab, 100% effort is the w/kg test figure with you subsequently being asked to put in 140% as the session intervals peak. The power-to-weight ratio (PWR) or watt/kg is cycling’s great leveler. 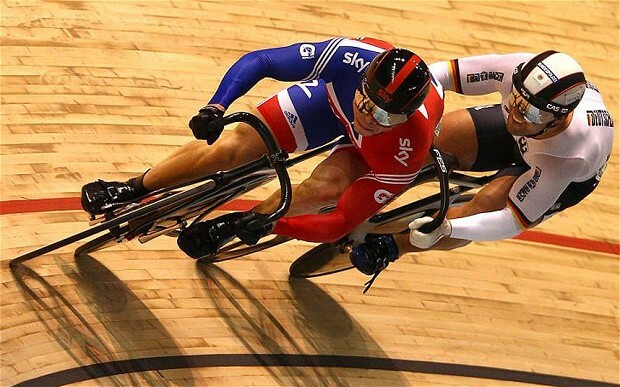 It’s a measure that allows a comparison of cyclists’ abilities even when the riders vary in size. To measure my watt/kg in this 20 minute test we took the average power over the time period – or NP – and then decreased the figure by 5% to account for an average over a full hour (approx measurement of course). In the test warm-up Wilson gave me a run through on the ‘tactics’ to get the most realistic stats on my present FTP. This advice was focused on not going too hard in the first 5 minutes to get a sense of what power I should be aiming for & then throughout the next 10minutes being disciplined with perhaps slowly raising this average power figure. The last 5 minutes…well that’s just grit your teeth time aka time to empty the tank. I knew before the test that amateur bicycle racers can typically produce 3 watts/kg for more than an hour (e.g., around 210 watts for a 70 kg rider), with top amateurs producing 5 W/kg and elite athletes achieving 6 W/kg for similar lengths of time. Interestingly elite track sprinters are able to attain an instantaneous maximum output of around 2,000 watts, or in excess of 25 W/kg; elite road cyclists may produce 1,600 to 1,700 watts as an instantaneous maximum in their burst to the finish line at the end of a five-hour long road race. As the test began I was admittedly shocked by the sudden increase in resistance, which I tried to react to with a sudden boost of power – I think I hit the 500-600 figure before adjusting to a comfortable level. The power for the first 3 minutes was at approx 300-320 but soon I realised that I couldn’t yet hold at this level. Of course this didn’t stopped me trying and for the subsequent 10 minutes my average level slowly tricked down from about 280 to 264 watts. I was definitely on the red line. In the final 5 minutes there was alot of biting lips or towels or T-shirts (anything to distract the fire in my legs) and my power kept jumping from 200 to 310 (I was obviously struggling even on the computer screen!) as I tried to keep my focus. Finally my average had dropped to 256 – a little disappointing – but I was certainly spent so no regrets there. 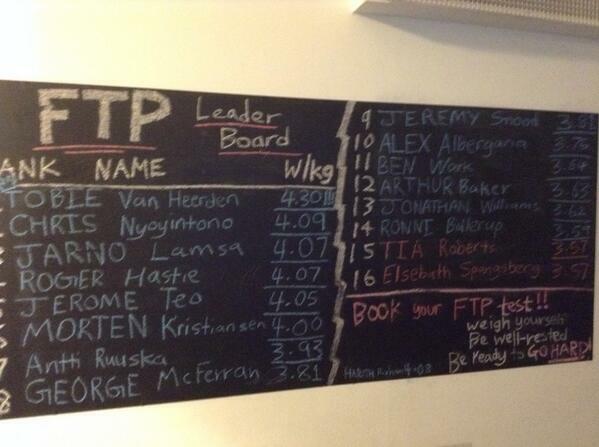 With my weight currently at a heavy 80kgs my FTP is 3.2. A figure that I was disappointed with. However there is no doubt the test will provide a key reference point as I train over the next 6 months. There will be a reassessment in 8-10 weeks in which I hope that now with a reference point (i.e. 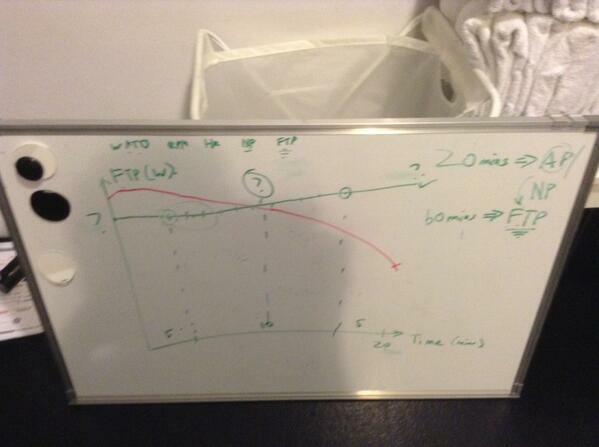 256) I will go at a steady pace for much of the FTP test, bringing it up in the final minutes. I have little doubt that with some focus training – and dropping a few kgs – I can get well established on the clubs leader board below and continue my progress for the start of the Deca Ironman in June 2014. The aim is certainly to drop the weight towards 75kg and push this power figure up towards 300 – squats anyone?!? You can see my stat profile below, it will be interesting to refer to this in 10 weeks. I know my figures have to be better!